Standards are prepared in Aculife treated high pressure gas cylinders from the pure compounds and diluted with ultra-pure nitrogen. Typically, the gas standards are prepared in two concentration ranges to facilitate air and seawater calibration. The ‘air’ standards are prepared with the ratios of the gases of interest similar to modern atmospheric values. The ‘water ratio’ standards are prepared with the ratios of the gases in the standard similar to those in modern near surface seawater. After preparation, the standards are monitored for several months to check for stability. Concentrations are determined by comparison to primary standards calibrated at the Scripps Institution of Oceanography (SIO). 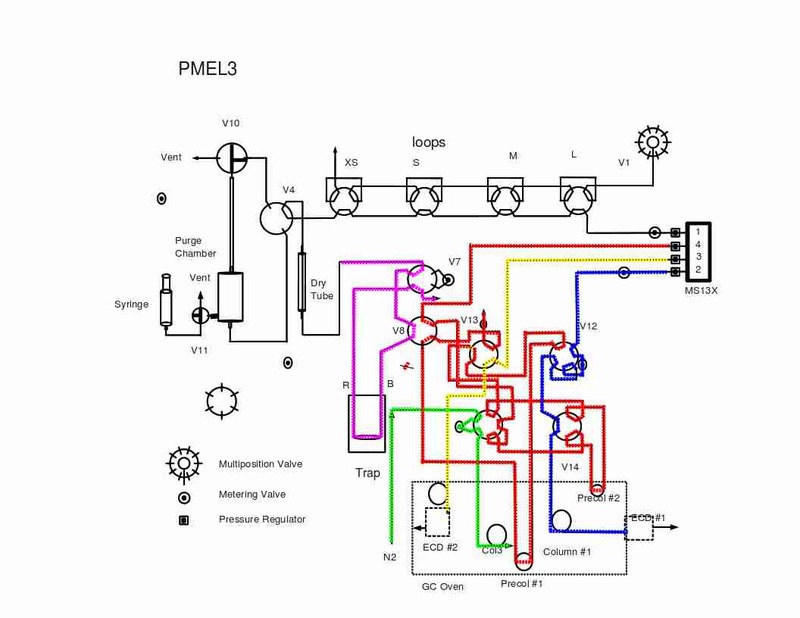 Schematic diagram of CFC/SF6 analytical system.